Hello, this is the first time I've made a topic in this forum. I am currently trying to improve an impartial Spanish fan translation, which is available for the original game. But I have a problem, which is that all the changes made to the qrc files, specifically those of the initial main quest, are not shown. Here's a small sample that in the original game you can see the changes, but not in unity. As my knowledges are very limited, it may be the tools I use, those of the problem. I'm using DFQQRCEDT. 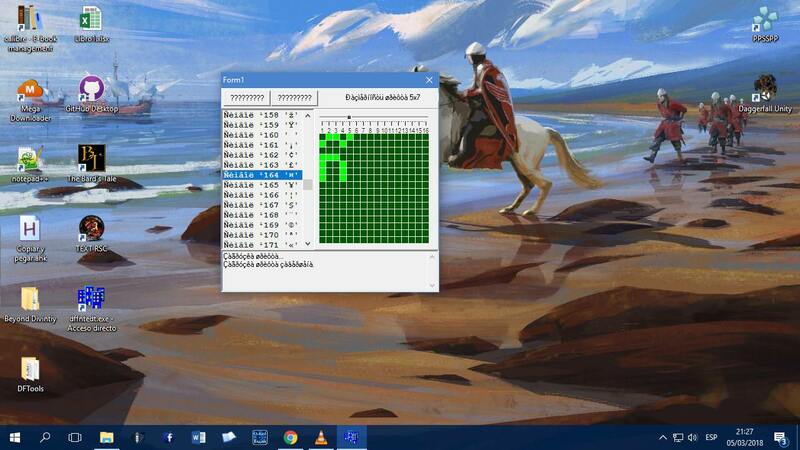 exe to translate the quest. This is just one of other problems I have, but perhaps I'll make an appropriate topic later. Last edited by delvisomanda on Sun Mar 04, 2018 9:23 pm, edited 1 time in total. The quest files have been processed into a scripting language and are packaged with DFU, you can find them in StreamingAssets/Quests directory. You may want to check out the pinned threads in the quests forum to find out more about how these files are edited. Thank you, I really don't know how I didn't notice it before. But I'm gonna take a look at what you told me. As Hazelnut mentioned, you'll find the quests scripts in the StreamingAssets/Quests folder (you can ignore .meta files on git). In your builds, this path is in DaggerfallUnity_Data\StreamingAssets (right next to the DaggerfallUnity.exe). 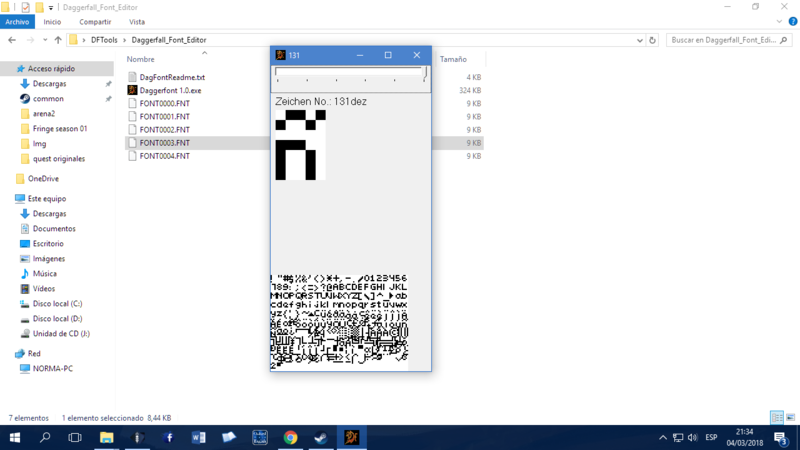 The quest scripts are compiled at runtime so you can make changes and test them live in the game. You'll only need a simple text editor to edit the quest files now, but you'll still have problems with the limited UTF8 character set Daggerfall uses. The FNT files are also included with builds now, you'll find them in the Assets/Resources folder. So any changes you make to the character set will also be ignored unless you replace the FNT files and create a new build as well. I need to have FNT files available to bootstrap the UI before user can even set their Daggerfall path. There are also a bunch of strings that are baked into FALL.EXE that have been migrated to HardStrings.cs. Daggerfall unfortunately keeps text all over the place without a very disciplined approach, and Daggerfall Unity is forced into much the same trap due to using the same classic data (with exceptions of FNT files, quest scripts, hard strings). It might be beneficial to setup a git fork of Daggerfall Unity project then others in the Spanish-speaking community can collaborate on editing the quest and source files while keeping them up to date with any changes to source. I would clearly like a better approach to translations in Daggerfall Unity. This was a goal early on before I learned the full extent of how difficult a process this would be. Daggerfall itself makes no concession towards localisation, which makes it very difficult to build this layer in without sacrificing some of my other goals. It's something we as a community should be able to improve later in the lifecycle but right now I'm mainly focused on gameplay features. I don't have any technical knowledge, but the link you gave me leads to the github page, that if I am not wrong, if I modify something there, I will ruin the project for others. So I will modify only the local files of my pc. But what I didn't really understand was the other thing. That if I don't modify the fonts (fnt) the special characters (ñ¡¿aéóú) I use, the game wouldn't recognize them. As far as I could see, these fonts have some of those characters, but if I modify the txt with the quests, they don't show them and I get question marks.
" ¡¿áéíóúñ! ?I am on a mission from the emperor to investigate"
At least the letter ñ should appear if I didn't misunderstand you. What you're doing so far is translating classic Daggerfall files without considering Daggerfall Unity as an extra layer on top of classic. You will necessarily need to deal with that layer also which requires additional tools (notably understanding git and Unity editor) before you can really progress. As I mention above, the FNT files are built into Daggerfall Unity in the Resources folder. This is required to bootstrap the user interface at startup before the user can set their game data directory. As such, any changes you make to the FNT files in Arena2 path will not be used by Daggerfall Unity. This is something that can be improved in future however (e.g. use built-in for bootstrap then switch to classic data for modded fonts). That's one of the reasons I recommended creating a fork of the project and maintaining translations in Daggerfall Unity itself. You don't need to send me a PR to the core project. 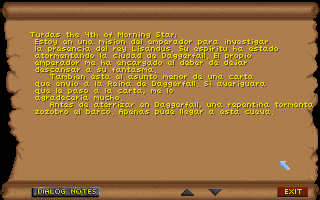 The Spanish-speaking Daggerfall community can create a translation fork and go from there. By using a fork you can update quest scripts, hard strings, FNT files, and any text in the code itself. Remaining text will be read from the TEXT.RSC, FACTION.TXT, etc. as normal. That way you end up with a custom translated build of the game localised to your language. 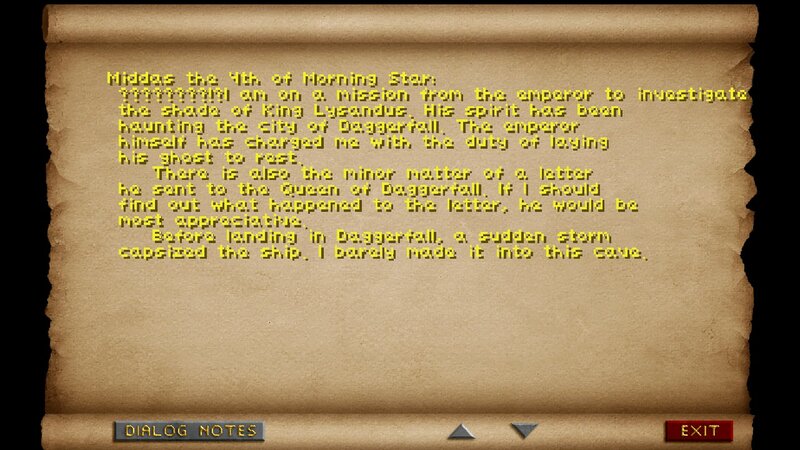 I agree the text and font handling in classic Daggerfall is unfortunate, and we inherit that same design. Fixing this properly is a massive engineering process that I don't wish to undertake at this time, or possibly ever. My focus is purely on gameplay features at this time. Just so we're clear. I can only translate, that's my only knowledge. All the other things you wrote are out of my league. I don't have any programming skills or know how to use github. I can avoid using words with the letter "ñ" or the other characters, in the translation. The Spanish language is quite rich and diverse. So it won't be very professional, but it will be quite understandable. The other fan translation has several grammatical errors and it is incomplete, but it is actually the only version available. I understand, that's why I'm trying to help by outlining the shape of the work. I'm trying to arm you with the information needed to succeed. You're already tackling some other tools and processes that aren't exactly easy, besides being fluent in at least two languages. You clearly have the smarts, and what I'm suggesting doesn't involve much (if any) actual programming to make some progress. I'm also happy to help by improving how certain things work on my end. If you can send me a zip of your modified FNT files to test with, I can change how classic fonts are handled in Daggerfall Unity so they can be modified easily. That might be a good enough starting point for now, and you won't need to dive into git or Unity to make some more progress. Sound good? Well, here's the font I modified. I think it should work, please take a look. The program I used is a russian one, called "dffntedt. exe". If this font works, I'll modify the others. I apologize if I take up too much of your time. I'll make some changes that should help you use the replacement FNT file directly and easily, and try to fix the text parsing problem that's causing everything to come up as "?????". I've already done the first item, but don't have time to look at the second issue right now. Will loop back to this as soon as I'm able.